This week’s Tuesday Tip is how to shape your iron shots from right to left and left to right to tricky hole locations on the green. When you’re in the fairway you have a couple of decisions to make regarding the hole location on the green. For today’s example, the hole location is favoring the right-hand side of the green so what you need to do is start your golf ball towards the safe side of the green, which is on the left. The goal is to have a slight fade for a right-handed golfer to attack this hole location. If the ball doesn’t fade at least it will end up on the safe side of the green. If it does curve, left to right, it’s going to get closer to the hole and chances are you might make the putt for birdie. The goal is to start your ball to the left of the hole location and then add a little bit of curve to make it go from left to right. Here’s how to do it starting with your set it up. You want to have your ball position slightly forward in your stance and open your body just a little. That’s going to help you get your swing direction to the left of the target, that’s very important. 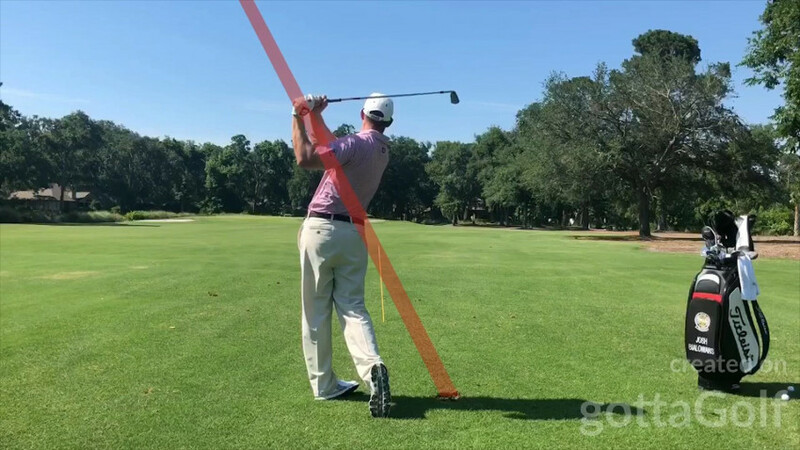 Next, we need to get the swing direction left of your body line and have the club face slightly closed with the handle back of center a touch. Favor some weight on the back foot here. The slightly closed clubface is going to help you start the ball left. The way you curve the ball is with the swing shape or “path.” Make sure when you swing the club the path of the club is going left, hard left, more left than the club face. (The path is going to be out to in and the clubface will be slightly open to the path, but closed to the target line at impact) So, get the ball position forward, open your stance up to get the swing direction to the left and have the face slightly closed to the target and swing across the shot. The second shot is the right to left shot. Typically, when you shape this ball you don’t want it to over cross the target, so a successful draw is going to be one that pushes off to the right and has a little draw basis at the end. Here’s how to set up for that shot. Have the ball position back in your stance just a little bit and get your swing direction lines towards the right of the target. Get closed to your target slightly; put the handle of the club slightly forward with the face slightly open. The way you put curve on the shot is with the swing shape, or path. Your path is going to be in to out, more so than the club face. The path will be to right and the clubface will be slightly closed to the path, but not closed to the target line (which is technically open to the target at impact). That is how your produce a push draw. Next time you find yourself in the fairway facing difficult hole locations, try out these tips to curve your iron shots either right to left or left to right.